The inaugural MU DuPont Pioneer Symposium is being organized by a group of six graduate students (from left): Avi Karn, Katy Guthrie, Dalton Ludwick, Marianne Emery and Ben Julius. Not pictured: Morgan Halane. For several years, the student-run DuPont Plant Sciences Symposia series has been going strong at universities across the United States and even the world — which is why Tim Beissinger was slightly shocked to find out that the University of Missouri was not part of it when he arrived on campus in September 2015 as an adjunct assistant professor in the Division of Plant Sciences in the College of Agriculture, Food and Natural Resources and as a research geneticist with the USDA Agricultural Research Service (USDA-ARS). “Given that we’re only four hours away from where DuPont Pioneer is headquartered in Iowa, it’s only natural that we would have one of these symposiums,” Beissinger said. After first bringing up the idea to various graduate students in the Division of Plant Sciences and/or associated with the Interdisciplinary Plant Group (IPG) in the spring of 2016, a group of six students quickly formed a committee in preparation for the inaugural MU DuPont Pioneer Symposium to take place on Thursday, Feb. 2, at the Bond Life Sciences Center with the theme “Building the Bridge From Fundamental Research To Improving Tomorrow’s Crops.” It will be the first event in the series to take place at other universities in the U.S. and abroad for 2017. Additional funding for the MU symposium is being provided by the IPG, the Division of Plant Sciences and the Division of Biological Sciences in the College of Arts and Science. As a graduate student at the University of Wisconsin-Madison, Beissinger was on the student planning committee in 2011 for the first symposium at the school, and the second location in the series. Through that experience, he met Tabaré Abadie, a senior research manager at DuPont Pioneer and director of the symposium series. The planning committee is made up of four graduate students in the Division of Plant Sciences (Dalton Ludwick, plant, insect and microbial science; Morgan Halane, plant stress biology; Avi Karn, plant biology and genetics; Marianne Emery, plant breeding genetics and genomics) and two students from the Division of Biological Sciences (Katy Guthrie and Ben Julius). “We all kind of work together from our experiences from different conferences and meetings and talk about ideas of what has worked and what has not,” said Ludwick, a third-year doctorate student who is co-advised by Deborah Finke, associate professor of plant sciences, and Bruce Hibbard, adjunct professor of plant sciences who, like Beissinger, also works for the USDA-ARS as a plant genetics researcher. 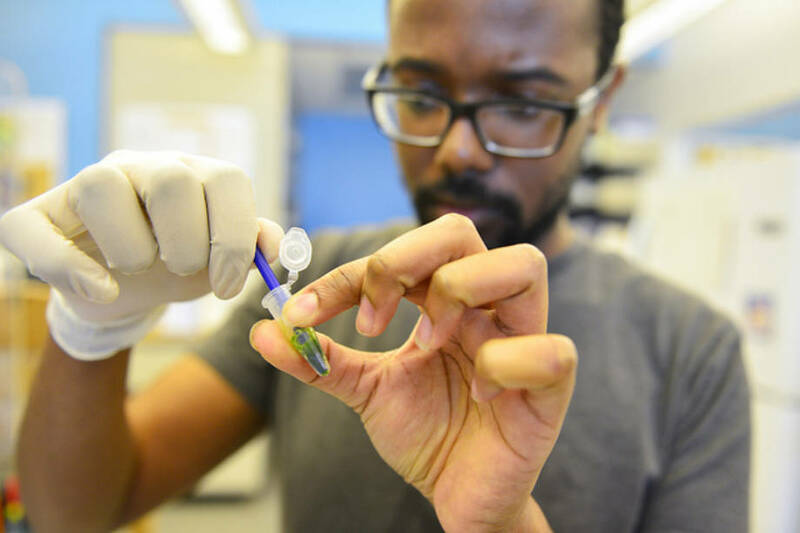 Morgan Halane, a graduate student who works in Walter Gassmann’s lab in the Bond Life Sciences … Expand ▸Morgan Halane, a graduate student who works in Walter Gassmann’s lab in the Bond Life Sciences Center, smashes an Arabidopsis sample with a tiny pestle. Halane is one of six graduate students who have organized the symposium. Photo by Caleb O’Brien. Although all six students are heavily involved in the preparation of the event, Ludwick’s peers nominated him as the chair of the committee, which has done everything from apply for funding for DuPont Pioneer for the symposium, to contact the speakers and make travel and lodging accommodations. “We all have different kinds of expertise, but it’s really important that if we don’t have the expertise, we ask someone who might and work with them,” said Ludwick, who earned his bachelor’s degree in plant sciences from MU in 2014. “Collaboration is always important, but so is getting stuff done on time. When Abadie started the first symposium in 2008 at the University of Minnesota-Twin Cities, he did so with very few rules in place to allow students the freedom to create their own space built entirely on academic discussion in the spirit of scientific discovery. The only requirements that Abadie and DuPont Pioneer have is that the event be free and open to anyone, have at least one of the speakers invited be from DuPont Pioneer and not have a theme that closely resembles another symposium or have two events fall on the same day. Other than that, the students are allowed — and encouraged — to invite anyone who might be able to provide healthy discussion on topics relating to plant science. Abadie mentioned that speakers have included environmentalists and representatives from farmers and organic groups. 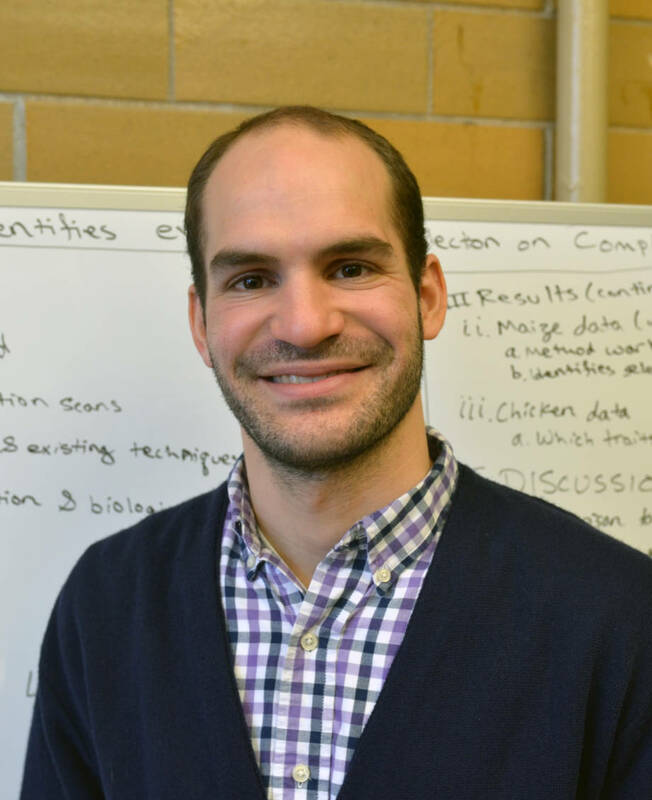 “In a way, we are helping generate this culture where we can all sit down together and talk about topics that we all think are important and we might agree or disagree, but we are doing it in a way that we are talking about science,” Abadie said. Several of the speakers at the symposium will provide insight on corn plants during the course of their presentations. Photo by Kyle Spradley. Kevin Hayes, team leader for genomics operations and protein structure analysis, DuPont Pioneer. He will be giving a special seminar at 3:30 p.m. on Feb. 1. A complete agenda can be found on the symposium’s website. Those who cannot attend in-person will be able to listen in as a webinar. Abadie began working at Pioneer (the company became DuPont Pioneer in 2012) in 2003 as a discovery scientist before later adding the role of establishing academic outreach with universities. He had a desire, though, to return to his academic roots, having spent more than 20 years as a professor in plant sciences at the University of the Republic in his home country of Uruguay. Following very enthusiastic feedback for three years at Minnesota (where Abadie had earned his doctorate degree), the program expanded to Wisconsin after asking the students from Minnesota to help train Big Ten Conference rivals how to put on such an event. “We thought this was too good of an idea to leave it in a single place,” Abadie said. The series has now conducted more than 65 events at more than 25 institutions on five continents. In 2017, MU will be joined by 10 other schools making their debuts in the series, including the University of Georgia and the University of Florida from the Southeastern Conference (SEC). There will be a total of 30 institutions taking part in the series this year, from the MU event in February to an event at the University of Queensland in late November. Abadie attributes the growth of the series to the fact that students from other institutions are encouraged to attend — and even small scholarships are available in some cases for this purpose. 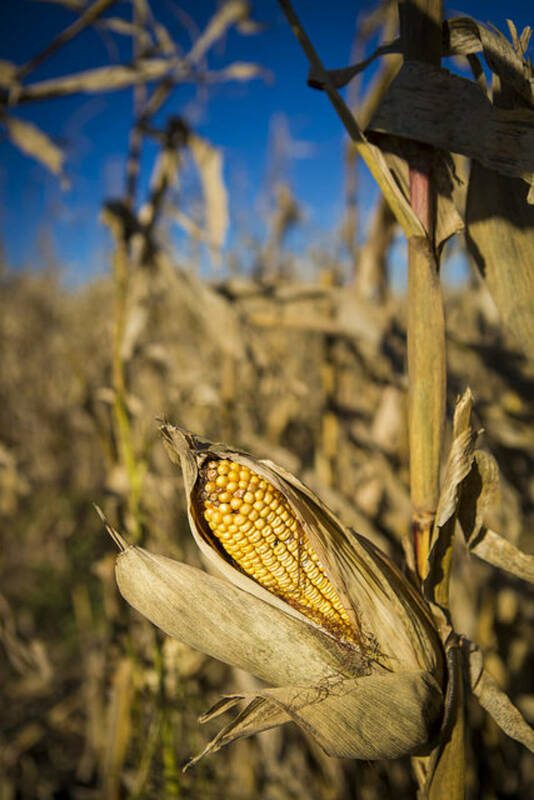 If all goes as planned, students will attend the MU symposium from as many as six U.S. universities involved in this year’s series as well as Mexican universities and the International Maize and Improvement Center (CIMMYT) in Mexico. To prep for their own symposium, Karn and Julius attended an event at the University of Illinois in 2016. Although the series has turned into a great recruiting tool for DuPont Pioneer — Abadie estimates that approximately 75 percent of the 100 or so scientists he has helped hire have been affiliated with the series in some way — its fundamental object is to serve as a networking platform for the students who will one day become the leaders of the plant science fields.